Evolution FM transmitter with 2n2218 with audio amplification step using LM741 op amp with audio input for MP3, MP4, mobile, computer and other audio sources, beyond the traditional electret microphone. With great sensitivity to the input signal. 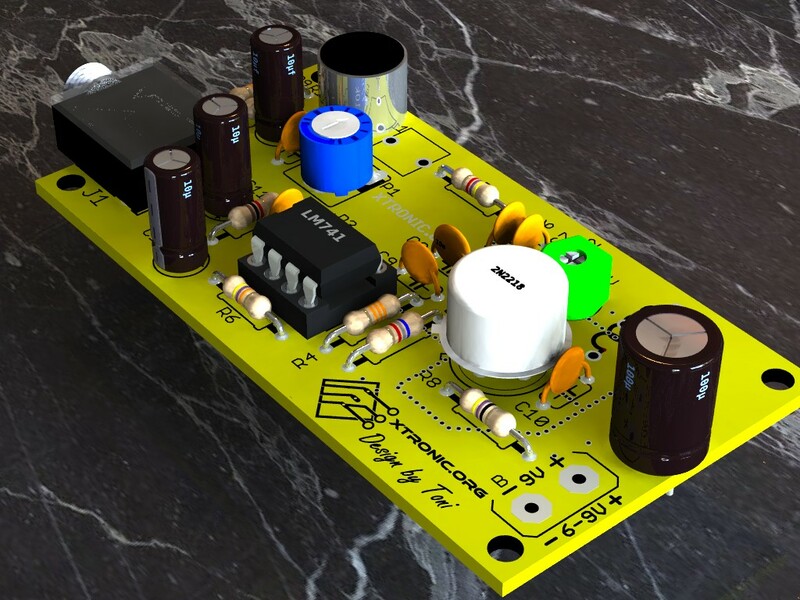 Using fewer components and easy assembly makes it ideal for those who want even without much experience assembling an FM transmitter with reasonable power. 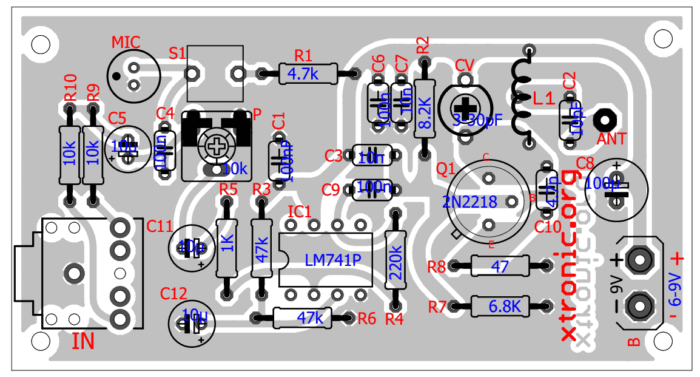 Circuit based on another project with transmitter 2n2218, posted on the blog. Power supply be 6 to 12V Battery or good quality power supply, is recommended during test and adjust use of 9 or 12V battery. The coil should be obtained four winding turns of enameled wire 22 AWG air core self sustained and 1cm diameter. Also in this case we connect the antenna between the third and fourth loop because it ensures greater stability in the transmission. The variable capacitor should be with maximum capacitance 30-50 pF. 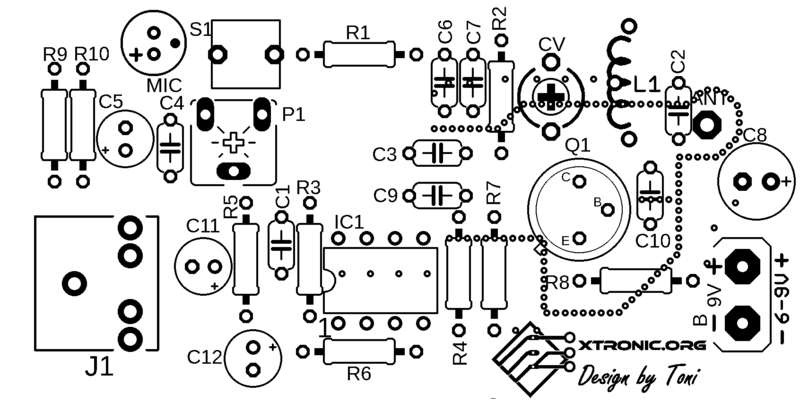 If you prefer you can use an adjustable coil of this FM receiver and put a fixed capacitor of 4.7pF instead of CV. The antenna can be a telescopic 80cm, a piece of stiff wire or a specific antenna for FM transmitter. Must be connected at the point marked by Ant and the coil is connected via C2. 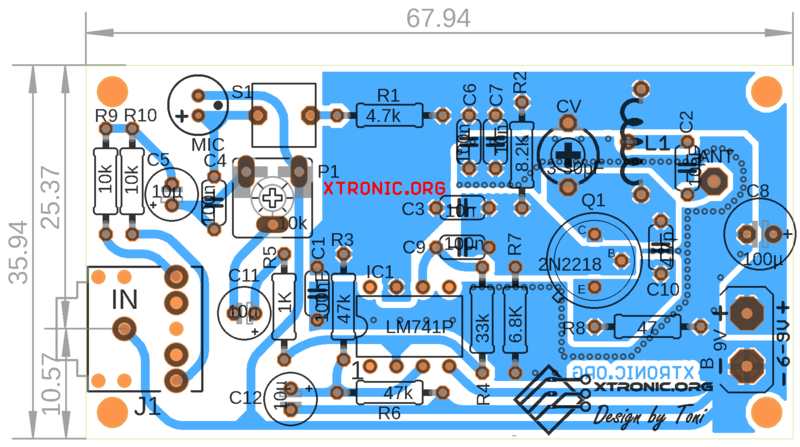 As the circuit has an audio input type P2 to be connected in many different audio source, we adopted a trimpot to adjust the signal level of the circuit. Also adopted was a key to disable the electret microphone. IC1 LM741P – Integrated circuit operational amplifier. 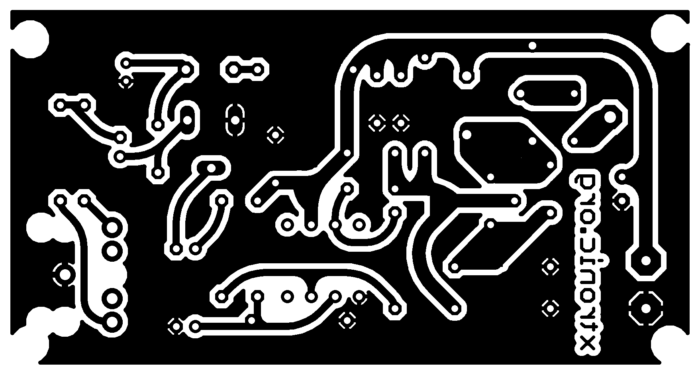 L Coil – See text. If you like assemblies transmitters see other related articles. 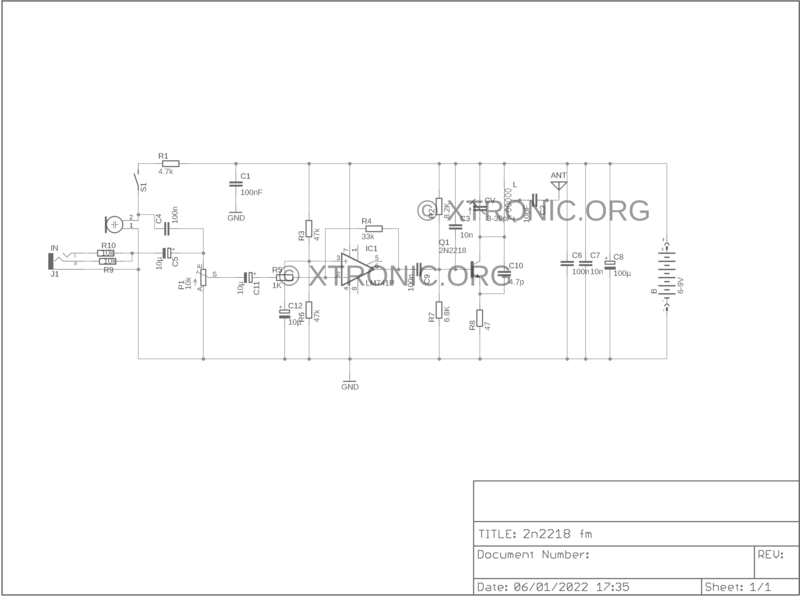 Download PDF files of this assembly – PCB, side copper, side components, pads, Silk, schema, Datasheet, 2n2218, 2n2219, LM741. Buy FM transmitter kits in Aliexpress with free Shipping in the Worldwide. Can I use LM741CN to replace LM741P? 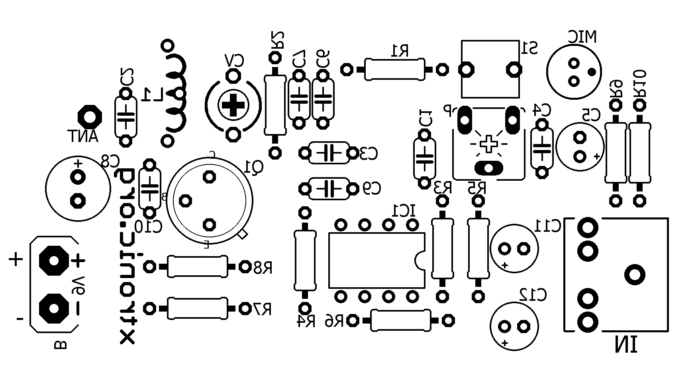 the LM741 IC in the diagram are points 1,5 and 8 left free not connected? 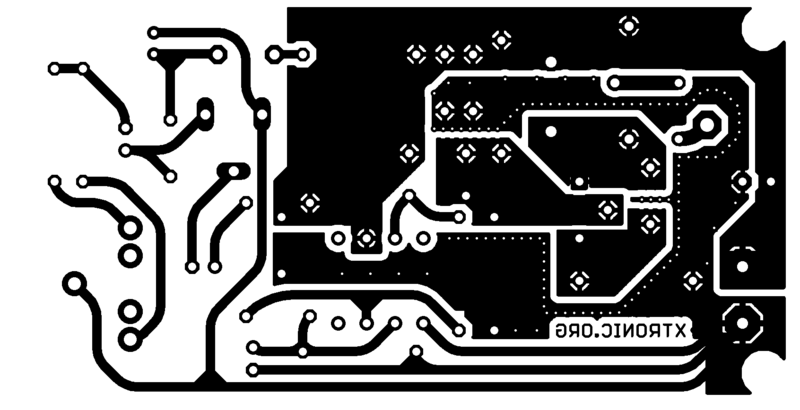 Can I use another NPN epitaxial silicon transistor? For example: KSC1815?